There was plenty of first round drama at the Africa Cup of Nations with debutants Cape Verde reaching the last eight at the first time of asking. Nigeria's Super Eagles hardly impressed but survived the first round cull. The end of the group stage gives us a chance to take stock of what has happened and look ahead to the future. Here's my take on the performances of the quarter-finalists and the eight countries who have gone home to lick wounds. Ivory Coast: Pretty much as expected from the Elephants, who continue to be driven by the guile of Yaya Toure. They turned on the style in the 3-0 demolition of Tunisia with Toure and Gervinho at the heart of that win. Although the Ivorians have been less than riveting to watch on occasions, they remain the team to beat. However, for that Nations Cup title to materialise, they will need a certain Mr Drogba to come to the party. Nigeria: The Super Eagles are in the quarter-finals despite failing to fully convince us of their worth. Coach Stephen Keshi warned ahead of the tournament that his side were far from the finished product. We now know what he meant. The lack of creativity is a big worry. But Keshi, for whom under-performing players is another major headache, will be hoping that Victor Moses and his Chelsea team-mate John Mikel Obi hit top form against Ivory Coast. Ghana: The Black Stars are exactly where they would expect to be. But for Ghanaians who hanker after the glory years, the truth is that Kwesi Appiah's side has again mixed brilliance with absolute tripe. Their next opponents Cape Verde might be in with a chance of qualification but are hardly the team to worry the four-time champions. Still, if there was ever an upset to occur, this would surely be it. Cape Verde: Unlike their fellow quarter-finalists, the Blue Sharks are not burdened by sky-high expectations. Finishing ahead of former champions Morocco and Angola in your maiden Nations Cup appearance is not to be sniffed at after all. The Atlantic Ocean islanders have played with the confidence of a team with nothing to lose, making up for their lack of quality with lion-hearted commitment. However, a meeting with Ghana means that life is about to get harder. South Africa: Patience in football does not last for ever, not in a nation where expectations of success are part of the DNA of supporters. So spare a thought for Gordon Igesund and his troops. They can be breathtakingly brilliant going forward but exasperatingly naive in defence. Bafana Bafana should fancy their chances against Mali as long as they can stick to their game plan and not get sucked into a physical battle of attrition by the more imposing West Africans. Mali: Captain Seydou Keita has made it clear that they are desperate to do well and give Malians back home something to shout about. The Eagles are never going to win awards for style but they are the ultimate team in terms of making the most of their resources. Defensively there have been some questions asked but coach Patrice Carteron has again been proving the maxim that a team is greater than the sum of its parts. A clash against South Africa gives them a great opportunity to make the semi-finals for the second tournament running. Burkina Faso: Surprisingly for some, the Stallions topped the group ahead of Nigeria. They arrived in South Africa burdened by a 17-match winless record at the tournament. But that monkey came off their backs when they thrashed Ethiopia 4-0 in a game that made everyone sit up and take notice of France-based striker Alain Traore. Can they reach the semi-finals for only the second time in their history? Without the injured Traore, it is difficult to see where their goals will come from. Togo: A quarter-final appearance appeared to be the limit of their ambitions when the tournament kicked off. But a meeting with a Traore-less Burkina Faso is not exactly a troublesome prospect, is it? The Hawks' inability to make their chances count is troubling but at least they are creating opportunities, and Emmanuel Adebayor seems to be enjoying himself for once in Togolese colours. 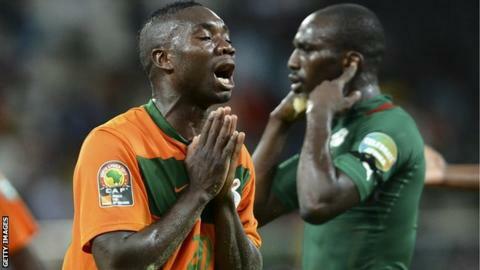 Zambia: Chipolopolo's success last year was as much a surprise to them as to everyone else. Granted, they were always going to face an uphill task after the 2012 triumph but three draws in three games is not what Herve Renard envisaged. They certainly have the potential to do better but captain Chris Katongo is among those in need of reinvigoration as the deposed champions focus on the Brazil 2014 qualifiers. Algeria: Where to start? At their best the Desert Foxes look a promising side, full of pace and potential. But they did not play like a team making their 15th Africa Nations Cup finals appearance. Far from it. The pre-tournament optimism has disappeared and although it may be too early to panic, the much-travelled Franco-Bosnian coach Vahid Halilhodzic may soon find the Algerian public's patience starting to fray. Morocco: When they have their best team out and bring their A game, the Atlas Lions are a match for anyone. This is why much was expected of them in South Africa. However, the team's youthfulness came at a price - inconsistency and naivety. Their defence was a shambles and they did not have the goals they needed anywhere in the squad. I have a feeling we will see a much more polished unit when they host the Africa Cup of Nations in 2015. Tunisia: The Carthage Eagles failed to make any sort of impression although Youssef Msakni was a joy to watch, and will continue to be as long as he is fit and healthy. Sami Trabelsi has a young team with some real quality. My main gripe is that they do not have a world-class defender or midfielder. If they can find a Slim Benachour-type figure to pull the strings in midfield it would really give them that extra edge. Ethiopia: For the Walya Antelopes South Africa 2013 was not about winning but their return to the big stage after a 31-year absence. They earned plenty of admiring glances with their attractive style, especially when drawing 1-1 with Zambia. Burkina Faso then exposed their shortcomings at this level, leaving their defenders looking like they had only met at a bus stop moments before kick-off. Niger: The Mena were ghastly to watch at times as they failed to produce anything that might raise even an inkling of excitement. They relied too much on captain Moussa Maazou and when he ran out of ideas, so did the rest of the team. In saying that, this was only their second successive Africa Cup of Nations appearance, so the experience should do them a world of good. Lest we forget, they also secured their ever Nations Cup point. DR Congo: What can I say about the Leopards? You simply cannot talk about the Leopards without mentioning the chronic administrative disorder that inevitably affects the way the team is prepared for big tournaments. There was a big burden on Dieumerci Mbokani to get goals, and Tresor Mputu-Mabi was a major letdown. First round elimination is clearly unacceptable for a team blessed with some genuine quality. Angola: Hardworking and battling - two words that spring to mind when you think about the Palancas Negras. The absence of these two qualities in South Africa explains the team's first round demise. If I was Angolan, my biggest concern would be captain Manucho's failure to justify all the hype that surrounds him.